This entry was posted in Desserts, I.C. Bladder Safe, Snacks, Yeast Breads, Biscuits and More. Friendly quick tip: If you have a sturdy metal or plastic strainer, and a bowl that will fit snuggly inside it, you can use that to “juice” the zucchini. It’s effective and quick. You can do the entire lot at once. Spread the shredded zucchini in the strainer. Put the smaller bowl on top and press down. The juice will stream out. Best to do this in the sink to limit the mess! Thanks for your comment, Lawrence! I will try that next time. That tip is better than my orange strainer, because the latter would require too many batches to squeeze it all. Thank you! I saw this on TV today and was shocked at how much sugar was used (about 2 tablespoons a slice). On the show they referred to this bread as a “healthy” snack!! Hardly! It is simply a cake with zucchini added. That is one thing that frustrates me about AKT. They discuss sacrificing a little in flavor to save time BUT never for health. Has anyone tried this with less sugar? You could definitely add less sugar. Try 3/4 cup or even a 1/2 cup, but of course it will be a lot less desserty. It’s not a true bread so it’s a misnomer. 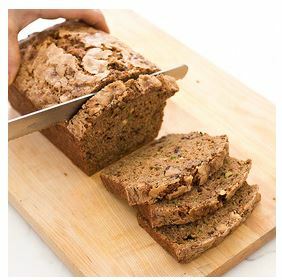 It’s truly a sweet bread (cake) but the fact it uses a vegetable and whole-wheat flour make it a much better choice over a triple-chocolate cookie or oversized cupcake with frosting and more. There are much worse things to bake for your health. But, definitely try less sugar and report back. Thanks.